Popped fuses, smoked relays and melted wires are telltale signs of big current draws. 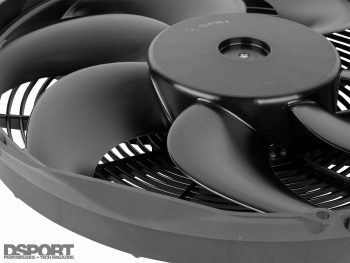 Electric cooling fans have traditionally been the biggest current hogs on any electrical device on an automotive application. Huge startup currents and high continuous currents can often cause fuses to blow, relays to fail and wires to melt in the cooling fan circuit. While undersized relays and wires are often to blame, it is the nature of a brushed motor that creates the issue. If you have ever pushed a car from a dead stop up to a rolling speed, then you have a sense of the current demand curve for a brushed motor. When the motor is completely stopped, a great deal of inrush current is needed to put it into motion and to overcome the inertia of the system. Once the inrush current is supplied, the motor begins to turn. As it gains speed, the amount of current drawn begins to fall. Once the motor reaches operating speed, the current demand reaches its minimal amount. New cars are moving away from brushed motors for many systems. Part of the move to brushless motors is the desire to increase fuel mileage. Brushless motors will often use only 50-to-60 percent of the energy as a brushed motor when operating at peak motor speed and even less when the speed is reduced. Since all brushless motors require a speed controller to create the moving magnetic field that makes the motor rotate, there is already an efficient means of reducing motor speeds when peak speeds are not needed. This can be used to reduce the energy consumption of a fuel pump during idle and cruising or it can be used to reduce the speed of an electric cooling fan when the vehicle is at speed. In addition, brushless motors have no wearable parts, so service life is greatly improved. A brushless motor will also not make sparks and it generally produces less electrical noise while providing higher output for its size compared to a brushed motor. Understanding in theory is great, but proof in application is a must at DSPORT. 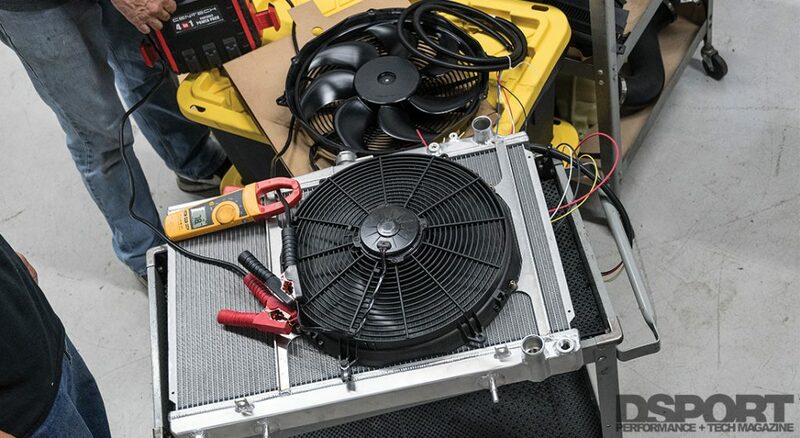 While we have already tested brushless fuel pumps and seen the superiority over brushed fuel pumps, this would be the first time we tested electric fans with both a brushed and brushless motor. For years, we’ve relied upon a 385mm (a.k.a. 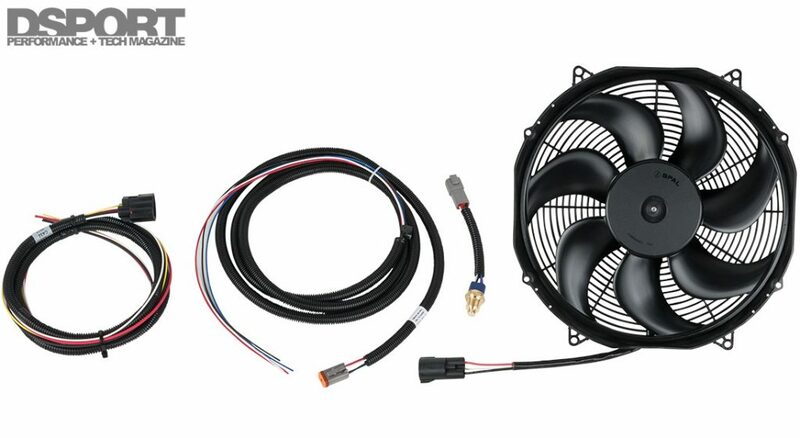 16”), 12V high-performance puller fan from SPAL (p/n 30102082 or VA33-AP71/LL-65A) to keep the cooling system at temp on our Project RH8 GT-R. On the vehicle, this fan is wired up with a 10-gauge wire, a 40A fuse and a high-current 80A relay. With the fan mounted to the radiator to simulate operating conditions, we recorded the startup and running current demands of this electric fan. Once the fan reached its peak continuous speed, it pulled an average of 22.0 amps of current at a supplied voltage of 13.5 volts. This equates to an operating energy of about 300 watts. We also started the fan from a dead stop and recorded the peak inrush current. This was as high as 89 amps and averaged over 80 amps. It’s these short but strong current pulls that tend to wear out under-rated fuses and relays and get your supply wires hot. 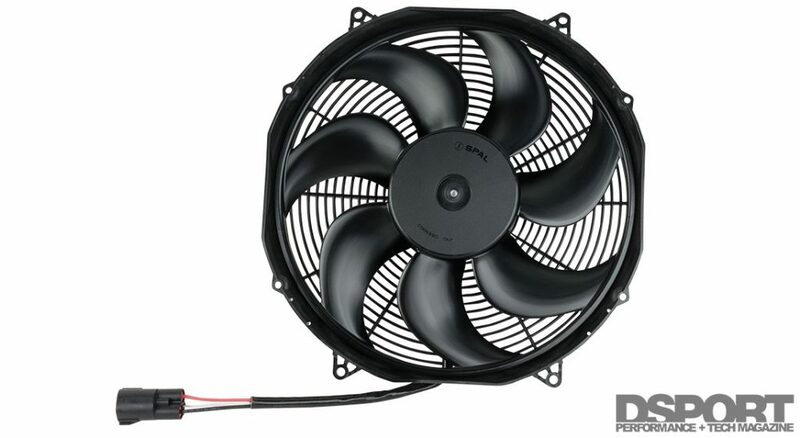 For comparison, we selected a 385mm, 12V high-performance brushless puller fan (p/n 30107072 or VA91-ABL326P/N-65A) to run against our brushed fan baseline. This fan is essentially the brushless twin. The only dimension difference is that this fan is even slimmer (81mm thick versus 95mm thick). The brushless variant is also a pound lighter (5.25 pounds versus 6.25 pounds). Of course, the newer technology brushless is more expensive with a street price of around $360 versus $165 for the brushed fan. Over the life of ownership, the difference in price will be made up in the savings in fuel. With the brushless fan mounted to the radiator to simulate operating conditions, we also recorded the current demands. 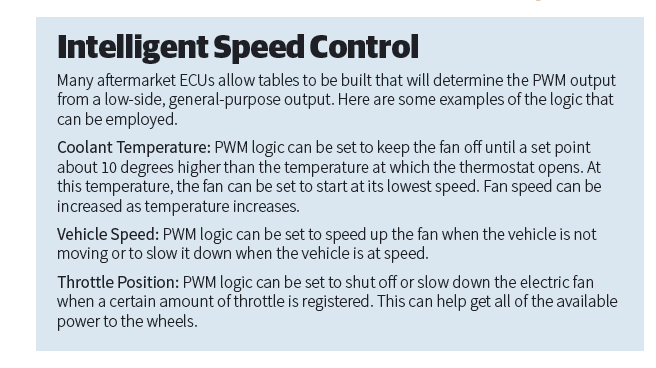 Since brushless fans require a PWM signal to set their speed, we used a signal generator to simulate a general purpose output from an aftermarket ECU (SPAL also offers a number of other solutions to control the fan for applications where a PWM signal cannot be supplied by the ECU). Once the fan reached its peak continuous speed, it pulled an average of 11 amps of current at a supplied voltage of 13.5 volts. This equates to an operating energy of about 150 watts, half of the brushed motor fan. 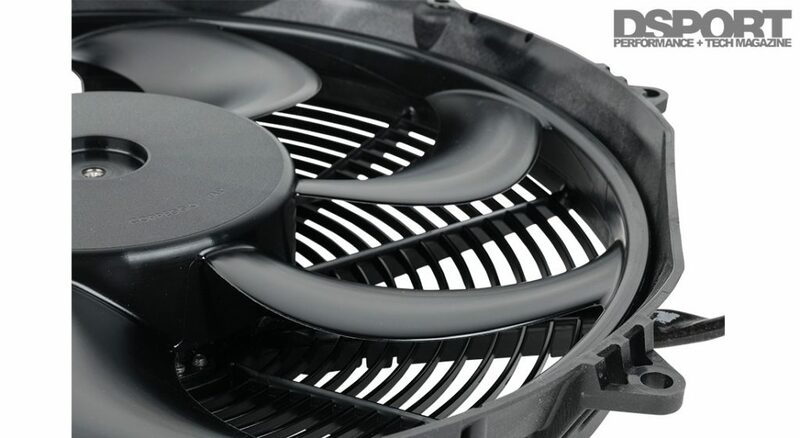 By manipulating the PWM signal, the fan speed could be reduced from 2,500RPM, down to about 850RPM. At the slowest speed, current draw is just under 4.0 amps. In this state, the fan is only using a little over 50 watts. However, what was truly impressive was the starting current. While the brushed motor fan pulled a mountain of current on startup, the brushed motor was the exact opposite. Instead, the speed control circuitry in the fan allowed for a soft start that slowly ramped up the current from 3.0 amps to 11.0 amps over a period of about 15 seconds. This soft-start strategy and the PWM-regulated speed control reduces wear on relays and keeps fuses happy. 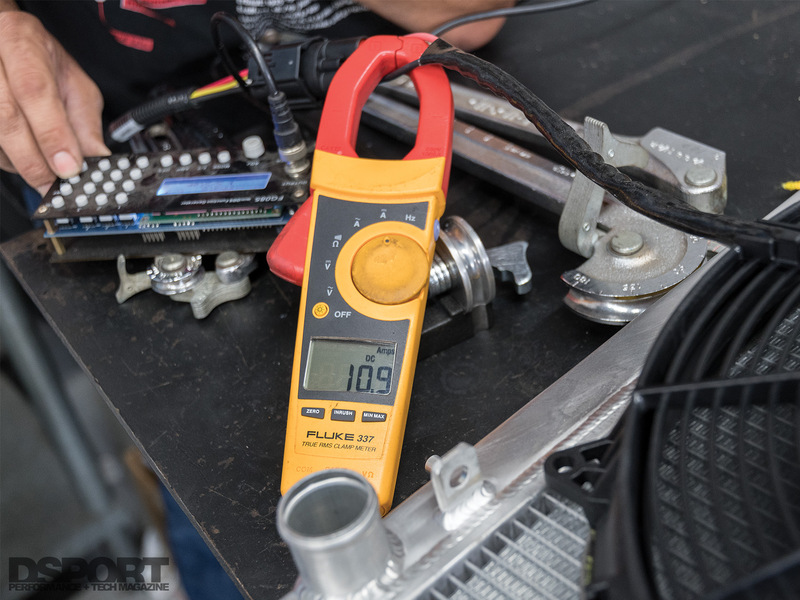 With a capable aftermarket ECU, the tuner has the ability to control fan speed based on many inputs (engine coolant temperature, vehicle speed, throttle position). Fan speed can be increased as engine coolant temp rises, it can be reduced as vehicle speed is increased and it can be reduced or shut off during full-throttle acceleration for peak performance. If you do not have an aftermarket ECU with a spare PWM output, SPAL offers solutions that allow the system to utilize a temperature sensor to trigger the fan and control the speed. When an upgrade is made from a brushed-motor to a brushless-motor electric cooling fan and the average energy consumption drops from 300 watts to 100 watts, fuel economy will increase on the order of 1 mile per gallon. Hence, if you drive 15,000 miles per year in a vehicle that normally gets 25MPG (but now delivers 26MPG after the brushless fan), you’ll save 23 gallons of gas per year. Depending on where you live and the price of gas, the additional cost of the brushless fan (about $200) would be offset in two or three years. You would also have about a half horsepower advantage at the wheels by reducing the draw on the charging system by 200 watts (15 amps). Brushless electric motors are becoming more and more common in automotive applications. In addition to brushless motors being used in engine cooling fans, we are also seeing brushless motors used in fuel pumps, power-assisted steering systems, ABS braking systems and even the climate control system. While OEMs have embraced brushless technology, it’s been relatively slow to catch on in the performance aftermarket. However, those that take the time to understand the advantages can reap the benefits of brushless motor fans and fuel pumps for increased performance, efficiency and reliability.